Electronic trading in fixed income markets: report by BIS (Bank of intl settlements) – worth reading! An interesting report (well worth reading), published in January by The BIS (Bank of international settlements), looks at the impact of ‘electronification’ of the fixed income markets. The report was based on structured interviews with market participants, and a survey of electronic trading platforms. An interesting report from The international Capital Markets Association (ICMA ), has mapped the features and coverage of European Bond Trading Platforms. According to the report, the European bond market trading has become increasingly electronic due to a natural evolution of trading, and more recently, as a by-product of regulation. Market participants have a regulatory obligation to evidence best execution and meet transparency obligations, but more importantly need to source and optimise liquidity. The fixed income landscape is currently very fragmented. The reduction in balance sheet due to Basel III combined with investors’ reluctance to trade has led to a diffusion of liquidity across platforms. This is particularly the case in corporate bonds where it is often heard that liquidity is “a mile wide and an inch deep”. Here is a chart from a previous post which shows the lack of inventory being held by dealers, making it harder for investors to find the liquidity they require. Sourcing and aggregating liquidity is paramount for sell-side and buy-side traders. Technology is the only way to enable these participants to uncover the liquidity available. Understanding the contrasts and capabilities of new and more traditional platforms, is the first step to choosing the best execution venue or information network available in the market. 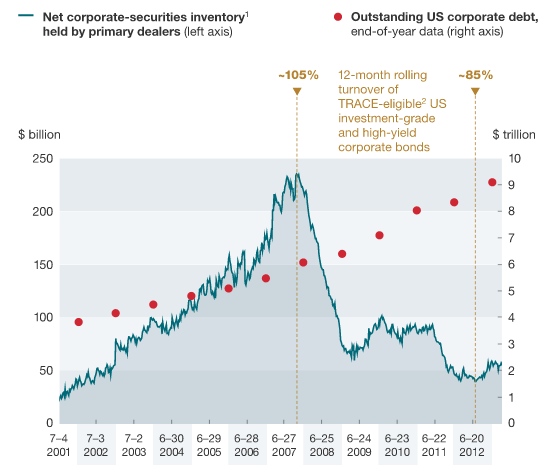 McKinsey and Greenwich Associates have produced a joint report on the challenges for the corporate bond market as it transitions from a capital intensive inventory based model to what they refer to as a ‘capital-light’ agency model, where broker-dealers hold less inventory. 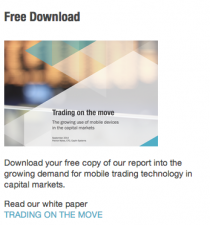 The report discusses how broker-dealers will need to leverage e-trading technology far more to assist their clients in liquidity discovery and help them with trade execution, as it has become increasingly difficult to find the ‘other side of the trade’.